In a post-apocalyptic future, a brilliant scientist finds a young cyborg woman in a junkyard and rebuilds her, bringing her back to life. She has no memories of her mysterious past, but she does know one thing: how to fight. 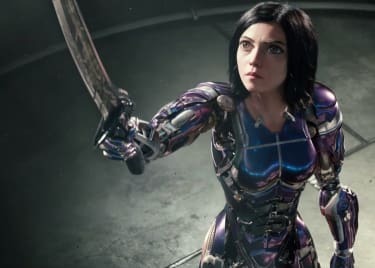 ALITA: BATTLE ANGEL is the new science-fiction movie from director Robert Rodriguez (SIN CITY) and producer James Cameron (AVATAR). Together, these boundary-breaking filmmakers bring Alita’s world to life with vivid special effects and thrilling action. What you might not know is that ALITA: BATTLE ANGEL is based on a comic book, and James Cameron has dreamt of this movie for decades. ALITA: BATTLE ANGEL is based on a popular Japanese manga, which in turn inspired animated movies and video games. Created by Yukito Kishiro, the “Alita” comics were originally titled “Battle Angel Alita.” The story was published between 1990 and 1995 in a series of nine volumes. Alita’s tale is set in Scrapyard in the 26th century and follows a brilliant cybermedic expert (sort of like a robot doctor) named Daisuke Ido, who discovers a young cyborg woman in a trash heap. He names her Alita, after his deceased cat. All that remains of Alita is her head and chest, but Ido manages to rebuild and revive her. The cyborg has no memories of her previous life, but she is incredibly skilled in Panzer Kunst, a fictional martial art. Soon, she begins using her skills to help others. Scrapyard is located on Earth (what’s left of it, anyway) and is home to various robots and lower-class citizens. Many were exiled from Tiphares, a floating upper-class city that sends all of its garbage and waste down to Scrapyard. Life is pretty rough for those living on the ground. Many people have modified their bodies with robotic parts just to survive. Alita first uses her skills to become a Hunter-Warrior who brings Scrapyard criminals to justice. Eventually, Alita starts fighting other robots in a brutal spectator sport called Motorball — and memories of her past life on Mars come trickling back. There are a few differences between the original comics and the new movie: Scrapyard is now called Iron City; Daisuke Ido’s name has been changed to Dyson Ido; and the film takes place in a dystopian future where the world was heavily damaged by a failure in technology. The core of the story, however, has remained mostly the same. Rosa Salazar (BIRD BOX) plays Alita, a cyborg who has no memories of her past life or how she wound up in a garbage dump. Christoph Waltz plays Dr. Ido, the scientist who rescues Alita from the trash heap and gives her a new body made out of spare parts. As in the comics, it’s immediately apparent that there’s far more to Alita than meets the eye. Although she doesn’t remember her past, she appears to be insanely skilled in cyborg martial arts. While it took some time for the comics to get to Alita’s backstory, her amazing past will come to light in ALITA: BATTLE ANGEL. Friends and foes are brought to life by an enviably good supporting cast. Jennifer Connelly plays Dr. Chiren, a former love interest of Dr. Ido who left him after they escaped from Tiphares. Oscar®-winner Mahershala Ali (GREEN BOOK) plays Vector, a man who builds combat bots for Motorball games. Michelle Rodriguez (FAST & FURIOUS) stars as Gelda, a cyborg warrior who trained Alita in combat in her past life. And Lana Condor (X-MEN: APOCALYPSE) is the orphaned teen Koyomi, who works as a freelance photographer. 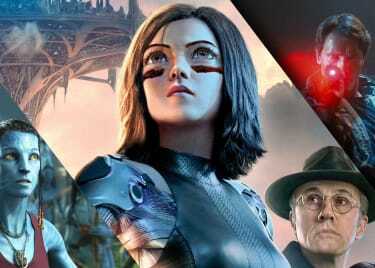 The movie even pays tribute to other versions of ALITA, with Jackie Earle Haley (WATCHMEN) playing Grewishka, a massive cyborg that appeared in the original animated movie. Then, there’s a villainous duo: Zapan (DEADPOOL’s Ed Skrein) and Nyssiana (BABY DRIVER’s Eiza González), who are sent to hunt down and kill Alita for mysterious reasons. 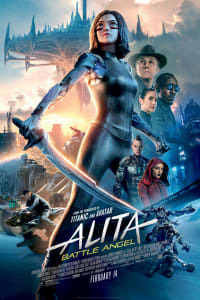 Producer James Cameron has been a fan of the original “Alita” manga for years — his TV series “Dark Angel,” which debuted in 2000, was partially influenced by the comics. Eventually he made AVATAR his priority, but ALITA has been on his mind for a long time. His love for the character and her world shows in the movie’s faithful approach to the story and the inclusion of a deep roster of fan-favorite characters. Cameron just had to wait for digital effects to catch up to his vision. Now that the day has come, we can’t wait for Alita to take her place in the world. ALITA: BATTLE ANGEL comes to AMC® on February 14.